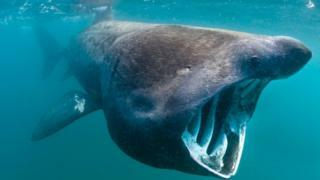 Scientists have gathered new footage they believe offers evidence that basking sharks gather in Scotland’s seas to mate.  The video shows sharks being “sociable”, including gathering in groups on the seabed. Basking sharks are the second largest fish in the world, reaching lengths up to 10m (33ft). Despite their size and prevalence in Scotland’s seas, little is understood about their social behaviours. Researchers from Scottish Natural Heritage (SNH) and the University of Exeter have been studying the animals since 2012. They recently spent a week off the coast of Mull in the Inner Hebrides tagging three basking sharks using towed camera tags. The cameras trail just behind the attachment point at the base of the main dorsal fin. 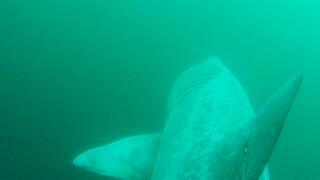 SNH said it was believed this type of tag has never before been used on basking sharks. Basking sharks are the world’s second biggest fish – the whale shark is the largest. They have no teeth and feed on microscopic plankton with their huge, wide-open mouths. Every summer the sharks gather in large numbers around small islands between Skye and Mull, off Scotland’s west coast. They are also found off the islands of Coll, Tiree and Hyskeir, before later migrating south to waters around Madeira and the Canary Islands off west Africa. The video footage collected by the tags will give scientists a new understanding of basking shark group behaviour. Dr Suzanne Henderson, policy and advice officer at SNH, said: “A large number of sharks appear each year just off the western coast of Scotland in the Sea of the Hebrides. She added: “There’s very little information about social and mating behaviours in basking sharks, or indeed sharks in general. Dr Matthew Witt, senior lecturer in natural environment at the University of Exeter, said the footage collected provided a “fantastic shark’s eye view” of the environment and new insight into behaviours. He said: “We can see sharks very closely aggregating near the seabed, potentially forming social groups. 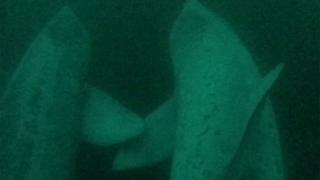 Dr Lucy Hawkes, senior lecturer in physiological ecology at the university, said was possible that future footage would record basking sharks mating. Data collected by the camera tags will also help inform future consultation processes around designating a Marine Protected Area by identifying why the area is important to the sharks. The researchers hope to return to Tobermory on Mull next year to obtain more footage. Minister for Rural Affairs and the Natural Environment, Mairi Gougeon, said, “The study being undertaken by Scottish Natural Heritage and the University of Exeter is an exciting opportunity to build our knowledge of how basking sharks use our seas.